Adam and Eve are male and female plaster moulds about 4ft 6in in height. How they came to be known as Adam and Eve is not clear, because Mr T.R. 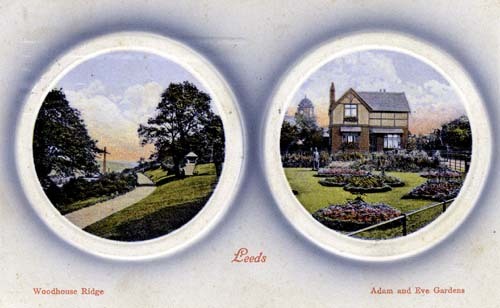 Trigg, Chief Officer of Leeds Parks, told a “Yorkshire Evening Post” reporter, they conform towards the shepherd and shepherdess types at one time so popular. There is a lot that is obscure about the statues, quite apart from the names they are known by. Mr Trigg thinks that simply by long association and usage the names Adam and Eve came to be applied to them. Where they came from, or how long they have been on the Moor are questions he is unable to answer. One employee of the Parks Department says he has known them for 25 years, but he has no idea what length of time they were on the Moor before that. Some years ago I was sitting on a form facing the statues when I overheard a conversation between the two Misses Smith, who at who at the time kept a private school near Woodhouse Moor, and they were saying how nice the statues of “Paul and Virginia” looked in their new coat of paint. I soon realised they were identifying the statues as the two figures in that French classic “Paul and Virginia,” and I think they were right. I never read of any dog in the Garden of Eden, but all lovers of the book remember “Fidele,” who found the children when they had lost themselves in the woods (Yorkshire Evening Post, 10 May 1935). Adam, in a sort of hiker’s garb, his mild features somewhat obscured by numerous coats of paint, stood looking over his shoulder at Eve, twenty yards away, playing with a faithful hound, christened “Pinch-me” by the Adamaneve habitués. Incidentally, in the middle of this garden there once grew a castor-oil plant which I am told, was frequently – and pardonably – confused with the Tree of the Knowledge of Good and Evil. Well, as I say, I noticed yesterday that Adam, Eve and Pinch-me have gone from their old haunts. 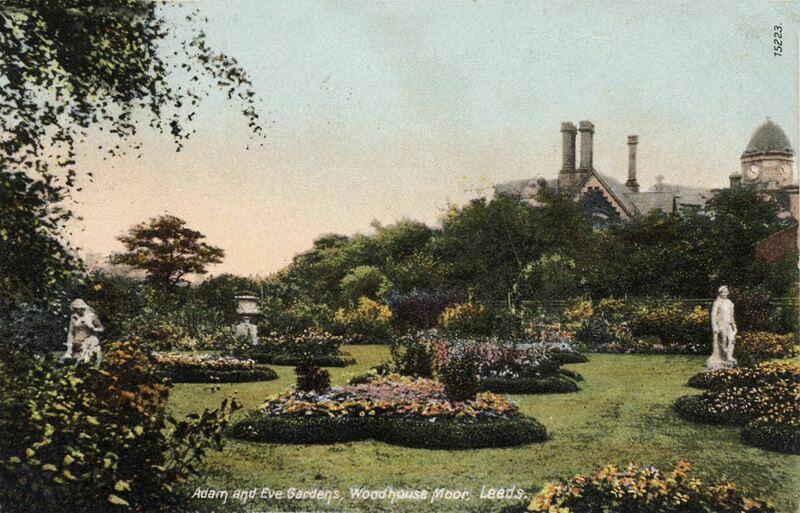 Eve, I hear, has been seen in Armley Park still playing with her faithful Pinch-me. Whether Adam is there also I don’t know, but I can see a sort of civil war arising when the inhabitants of Woodhouse learn of the theft. Like the Greeks after stolen Helen, they will sally forth against Armley in a fleet of a thousand tramcars to regain their Eve.